Composite restorations can be used to repair worn or fractured front teeth by matching the tooth tissue colour to various white filling materials. The dentist will usually numb the area with local anesthetic and remove any decay or old filling. He may also remove any weakened tooth which would be likely to break later. The dentist then prepares the surface of the tooth using a mild acid and a bonding agent (to act like a cement), before placing the filling material in small increments. The filling is then hardened using a bright light. The filling is then trimmed and polished as necessary. Unlike silver (amalgam) fillings, a composite sticks to teeth and can form edges so it can be used to repair front teeth that are damaged or broken. It can also be used as a veneer to cover marks in the teeth. White fillings come in a range of shades so can be matched to the colour of your own teeth. In addition, because white fillings stick to teeth, they need less preparation than a metal filling. 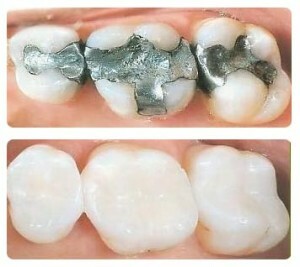 However, white filings take longer to place, so cost a little more than metal fillings.